My first enounter with the Taiwanese version of 蜜芋頭 candied taro was many many years ago, during one of our earlier trips to Taiwan. 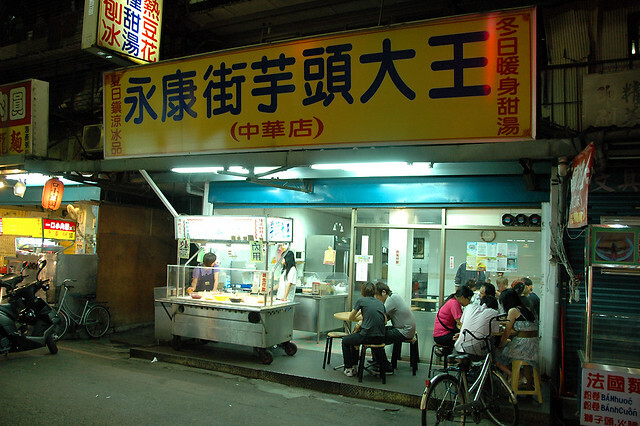 It was before the days when eating 芒果剉冰Mango Shaved Ice was a craze at the old Ice Monster (冰馆) at Yong Kang Street, the dessert shop often featured in guidebooks then was 臺一牛奶大王 just opposite the National Taiwan University near the junction of Xinsheng South Road and Roosevelt Road. I remember vividly the 综合牛奶冰 I’d ordered, getting the shock of my life when the gigantic bowl was sent to me. So many textures, so many different types and degrees of sweetness, all in a bowl. I managed to get the last portion of 芋頭牛奶冰 for the day and it was no less bigger than the one at 臺一牛奶大王 we had previously. The portion was extremely generous and I ate till my heart’s content as I have a certain weakness for taro-based desserts. It was sweet yes, but not overtly and sickeningly sweet. Perhaps the ice has a tastebuds numbing effect? 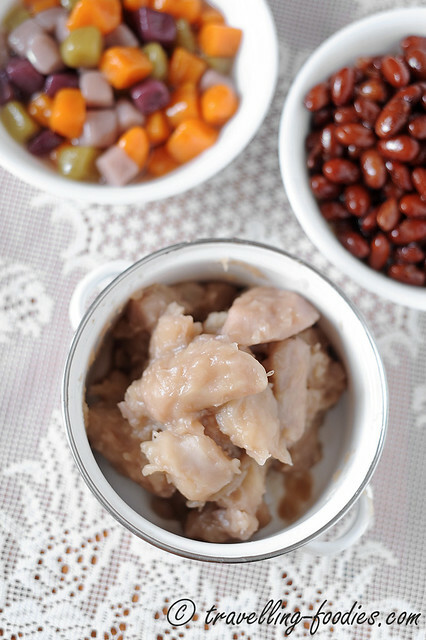 Making candied taro is a rather simple and fairly straightforward process. Choosing the taro is important. Given two of the same size, always choose the one which is lighter in weight. 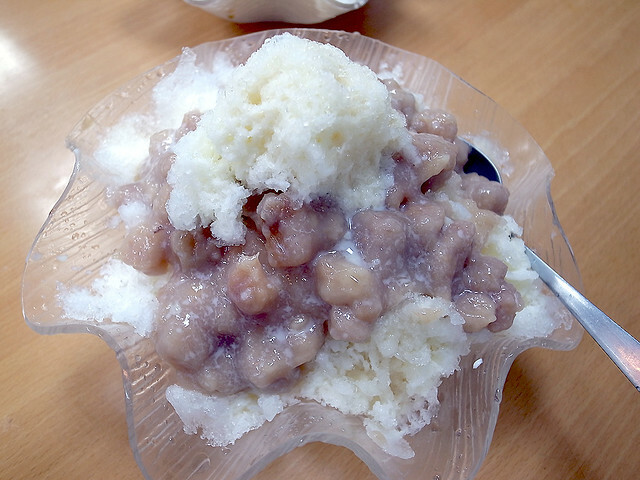 With lesser water content, the lighter taro is said to be more 松 “sang” and thus taste better. It is also easier for it to absorb any surrounding flavours, in this case, the sweetness from the sugar added. After shaving off the skin, the taro are cut into large cuboid pieces before being steamed until they are soft enough for a chopstick to go through. In the shops, the taro are cooked and candied whole, cut only when the whole process is over. This helps to ensure that the taro pieces remain large intact, making it more appealing and presentable. When we prepare this at home, the process is reversed. Cutting comes first before steaming and the candying process, helping to hasten the whole procedure somewhat. In Taiwan, there best taro is a variety called 槟榔芋 from 大甲 in Taichung. In Singapore, we get either taro from Thailand or Malaysia. The longish variety from Malaysia is texturally closer to the varieties grown in Taiwan. Those from Thailand tend to be more stubby chubby looking. 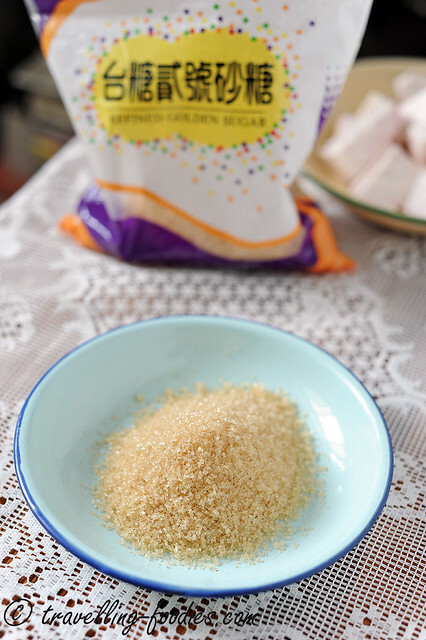 Traditionally, light golden brown sugar which the Taiwanese call 二号砂糖 or simply 二砂 is used. Apart from being sweet, the sugar also exudes a lovely aroma… all soaked up by the taro. Demerara sugar is a good substitute. Otherwise, a mixture of muscovado and white granulated sugar in a ratio of 1:3 would also work. The ratio of peeled taro to sugar should be 4:1. Do not cut back on the amount of sugar used as the whole point of candying the taro is for them to taste sweet. Only with sufficient sugar can entire pieces of taro be perfectly candied to the core, lending each piece that glistening translucent appeal. Cut the peeled taro into large chunks and steam for about 20 min until JUST soft enough for a chopstick to poke through with reasonable ease. While the taro pieces are still hot, put brown sugar over taro and toss gently until all the pieces are well coated and the sugar has mostly melted. There is no need for the sugar to be completely melted. Pour the sugar coated taro piece into a shallow wok or saucepan. Make sure that the pieces are well laid out and not stacked or piled on each other. Add water and stir gently to melt more of the sugar. Turn on flame and bring mixture of a boil before lowering flame to a very gentle simmer with lid off for 10-15 min until there is very little water left. Turn the taro pieces periodically during this time. Cover with lid and let it cool down slowly to room temperature over the stove. Pack the taro pieces into a container and refrigerate until cool. 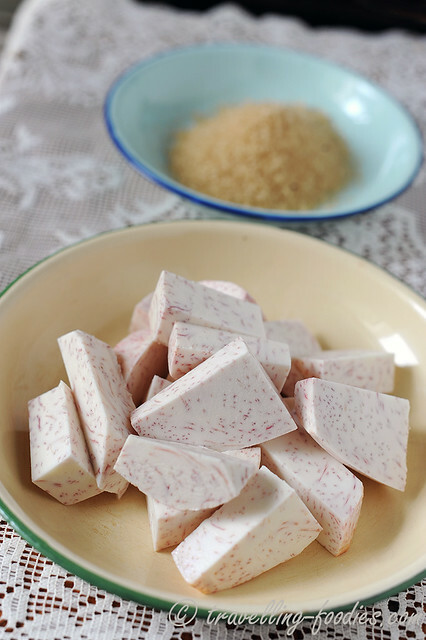 The candied taro is now ready to be used for other desserts, or simply enjoyed on its own. 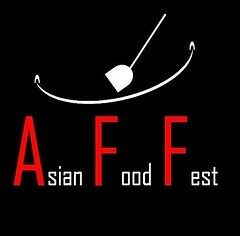 This entry was posted on August 27, 2014 by Alan (travellingfoodies). 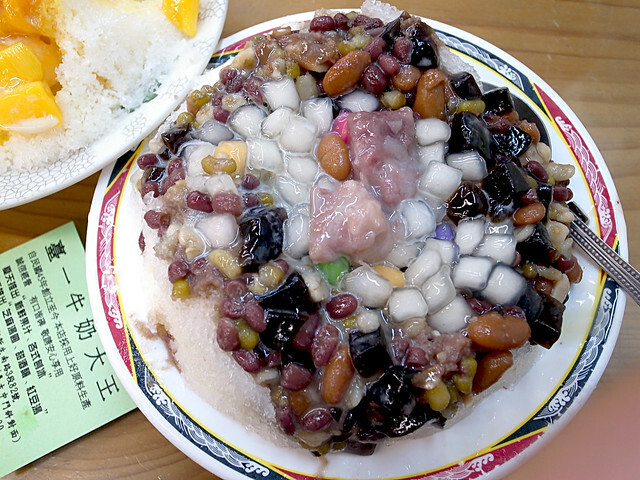 It was filed under Food, Simple Eats and was tagged with Candied Taro, Candied Taro Cubes, 芋圆, 蜜芋頭, 蜜芋头, yam, 大甲芋头, 槟榔芋, 二砂, 二号砂糖.